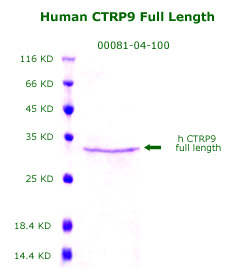 Dr. Yuan Y and Dr. Ma XL had used Human CTRP9 full length (order code: 00081-04-100) and human CTRP9 globular form (Order code: 00081-01-100) on follow publication. C1q-TNF-related protein-9, a novel cardioprotetcive cardiokine, requires proteolytic cleavage to generate a biologically active globular domain isoform. Am J Physiol Endocrinol Metab. 2015 May 15;308(10):E891-8. doi: 10.1152/ajpendo.00450.2014. Epub 2015 Mar 17. Dr. Wang and Dr. Ma XL had used mouse CTRP9 elisa kit (Order Code: SK00081-08) and mouse CTRP9 recombinant (Order code: 00081-03-100 ) from Aviscera Bioscience on following paper.